The Mentor Committee focuses on bringing members together in purposeful, mutually rewarding relationships through the organization’s annual Mentor Program. At the completion of the application period, the Mentor Committee reviews the applications and matches mentees with mentors based on the profile information provided. The Committee notifies the participants of their matches and serves as contact for participants throughout the duration of the Program to assist matches in making the most of their experience. The Committee facilitates several face-to-face group meetings and provides tips to both mentors and mentees in order to help set expectations and to ensure a successful mentoring relationship. The CREW Boston Mentor Program offers traditional mentoring pairings, where members of the organization who can offer guidance and support to their less experienced counterparts – those members who have been in the industry or have been specializing in their area of expertise for a lesser period of time – are coupled together, and colleague to colleague mentoring, where industry peers are coupled to share ideas, talk about successes and challenges, and grow together. The CREW Boston Mentor Program provides a simple way for mentors and mentees to form rewarding, mutually beneficial relationships. The CREW Boston Mentor Program is open to members only. Join the CREW Boston Mentor Program and help inspire excellence by providing support and career guidance to another member who will benefit from your unique experience and skills. Sharing your knowledge will open a mentee’s eyes, and working one-on-one with a mentee will give you new insight and a fresh perspective. Mentoring is a personal and important way to impact another member and give back to the organization. When you join the CREW Boston Mentor Program, you gain insights and connections that can help you expand your horizons and skillfully navigate your career path. Your mentor will share advice and personal experiences, and help you build your network and gain new perspective on the possibilities open to you. The 2017 CREW Boston Mentor Program will begin this fall and members interested in applying to be a mentor or mentee will have the opportunity to do so from October 11 through November 4. Members apply to the Program by completing an online survey that provides basic information to assist in the matching process. Matches are determined in the fall with the Program running from January through June 2017. Link available soon...Click here to sign up as a mentor or mentee for 2018-2019. We don't currently have any events to display for this committee but check back soon! The Mentor Program had a very successful kick off lunch at KeyBank Real Estate Capital. This year’s Program is comprised of 40 members, including Peer to Peer and Mentee to Mentor pairs. Hayley Suminski and Erin Channel, co-chairs of the Mentor Program, kicked off the lunch by welcoming the pairs and asking everyone to introduce themselves to the group. After introductions and learning about suggestions for a successful experience, the mentors and mentees broke out into pairs to formalize their match and discuss logistics, as well as, what the mentees are looking to accomplish to begin a productive and rewarding mentorship relationship. The Mentor Program had a very successful kick off lunch at KeyBank Real Estate Capital. This year’s Program is comprised of 50 members, including Peer to Peer and Mentee to Mentor pairs. Hayley Suminski and Joanna Murray, co-chairs of the Mentor Program, kicked off the lunch by welcoming the pairs and asking everyone to introduce themselves to the group. After introductions and learning about suggestions for a successful experience, the mentors and mentees broke out into pairs to formalize their match and discuss logistics, as well as, what the mentees are looking to accomplish to begin a productive and rewarding mentorship relationship. The Mentor Program had a very successful kick off lunch on January 12th at KeyBank Real Estate Capital with over 30 participants from the program in attendance. This year’s Program is comprised of 58 members, including Peer to Peer and Mentee to Mentor pairs. pairs and asking everyone to introduce themselves to the group. After introductions and learning about suggestions for a successful experience, the mentors and mentees broke out into pairs to formalize their match and discuss logistics, as well as, what the mentee are looking to accomplish to begin a productive and rewarding mentorship relationship. The 2016 Mentor Program wrap up lunch on June 15 celebrated the success of the program, which this year included 30 matches, both peer to peer, and mentor / mentee. Attendees enjoyed lunch and networked in the brand new Kimball Office showroom located at 70 Federal Street with refreshing views overlooking Post Office Square. On May 4th, mentors and mentees were treated to a special night of networking, fashion and style tips, and swag bags. Andi Simpson of Federal Realty provided a brief overview of the Assembly Row development, the success it has experienced since the first phase opened in 2014, and the growth it will see over the next few years as the next phase unfolds. Aricia Symes-Elmer, Founder of Shift Your Style, then gave a riveting presentation on developing and embracing your personal style and building balance into our wardrobes. Listening is a core skill for both the Mentor and Mentee in any effective mentoring relationship. Listening on all levels; physical, intellectual, emotional and intuitive; creates a foundation to lead all facets of our lives. 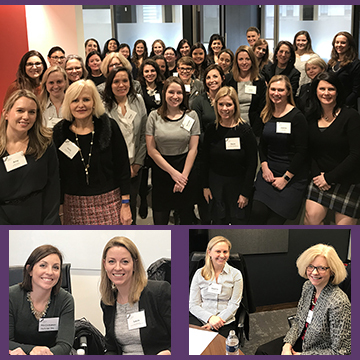 Mentors and mentees participated in a hands on experiential workshop and picked up a few listening tips and tools to enhance their personal and professional relationships with Jenn Tenczar Piacitelli, a professional coach and HR leader. The Mentor Program Kick-Off Luncheon was a great success with almost 50 members in attendance. This year’s Program is comprised of 30 matches, including Peer to Peer and Mentee to Mentor pairs. The discussion was kicked off by Cara Nelson, Partner at DLA Piper and this year’s President Elect. On Wednesday, September 16th CREW Boston members gathered at DLA Piper's Boston office for a night of speed networking. A joint event of the Mentor Committee and the Rising Leaders Networking Group, the evening started with brief testimonials from Holly Nelson, Senior Vice President with U.S. Trust, and Joanna Murray, Asset Manager with TA Realty, about their experiences in last year's mentor program where they were paired together. Both having had a great experience they encouraged others and especially those that could be mentors to join this year's program. ©2015 - 2019 CREW Boston. All rights reserved.